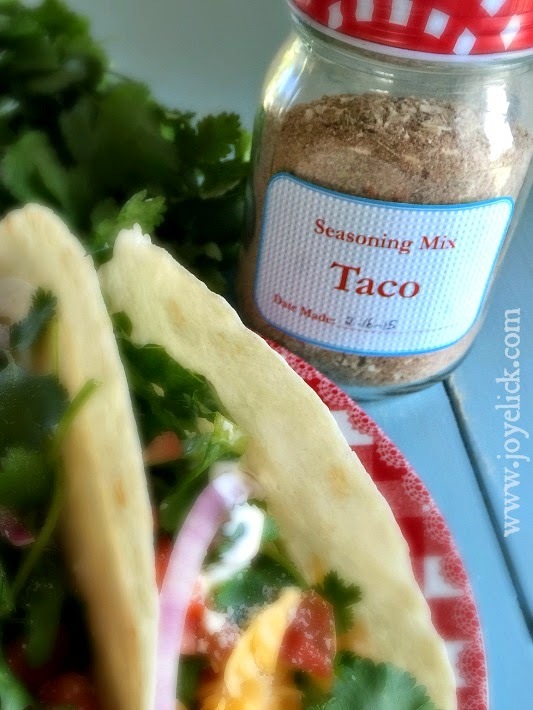 Homemade TACO SEASONING MIX: The frugal farm girl's DIY ready-made mix series. 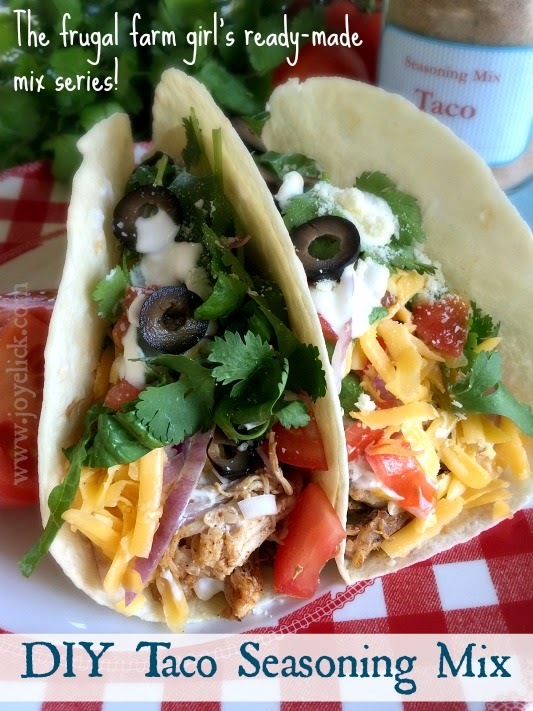 Taco night is a favorite around our house, especially when it's chicken tacos made with my homemade Taco Seasoning Mix. Learning to make our own seasoning mixes is just one way my family is taking more pride in what we produce in the kitchen. It's also one small step toward self-reliance. By that, I mean we don't eat out anymore (hardly ever), and we don't buy prepared food from the store nearly as much as we used to. 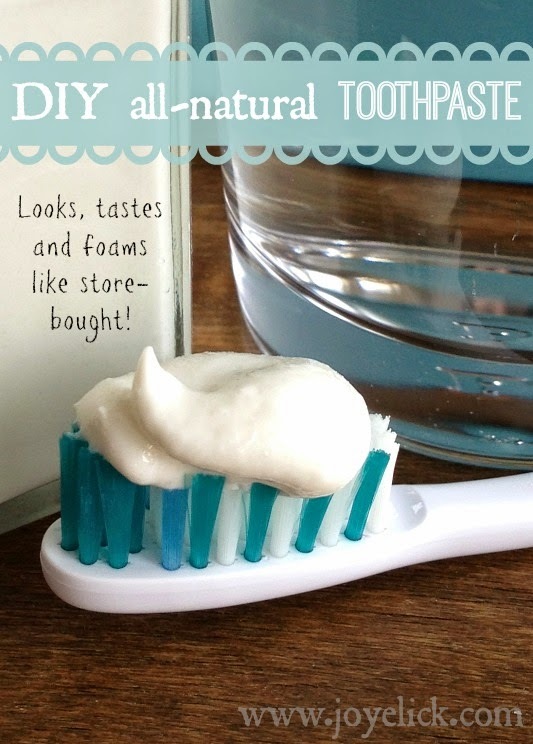 Instead, we're learning to make things at home. But we still like convenience. 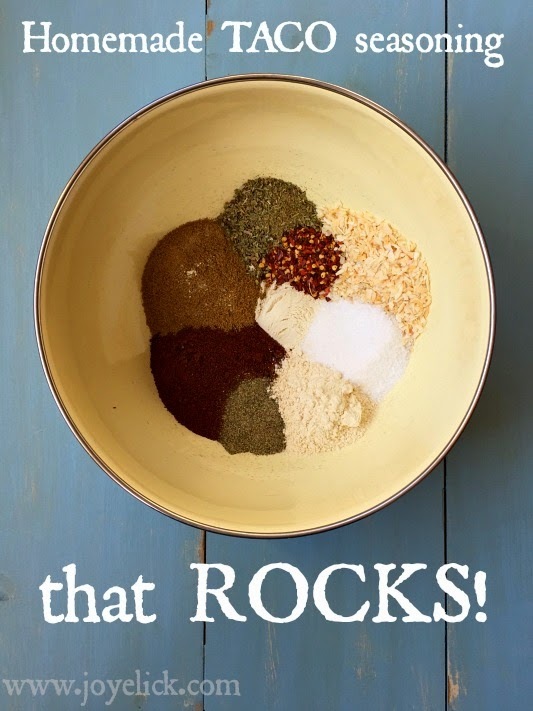 That's why we started making ready-made mixes for the things we use all the time, like taco seasoning. Why bother making your own seasoning mixes? Craft. 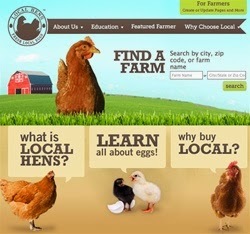 As a culture, we've become dependent on the industrial food machine to dictate to use what food should taste like. Like other heritage skills, herb and spice blending is a lost art to many of us. Rediscovering the craft of blending your own herbs and spices can not only breathe fresh flavor into your cooking, but also new enjoyment. It's fun to discover the individual spices and then construct your own seasoning blends from the ground up. As you work with the unique flavors of each ingredient, you become more knowledgeable and skilled as a cook. Your confidence grows. And pretty soon, you're making ALL your seasoning blends. But it all starts with deconstructing the first one, and seeing how it all goes together. That's what we're going to do today (so keep reading)! Self-reliance. Are you tired of depending on the industrial food machine for every last little thing? Join the revolution! No matter how small it may seem, every time you make something homemade, you take a baby-step in the direction of regained self-reliance. When I speak of regained self-reliance, I'm thinking of what we've lost since our grandmother's ruled the kitchen. Not only did they make their own bread, milk the cow, and can tomatoes, they knew how to blend seasonings. We need to be liberated! By making our own seasoning blends,we're no longer limited to whether or not we have a silly store-bought packet in our cupboards. You want tacos for dinner? No need to drop everything and run to the store. Just open your spice cupboard and make some magic! Not sure where to begin? 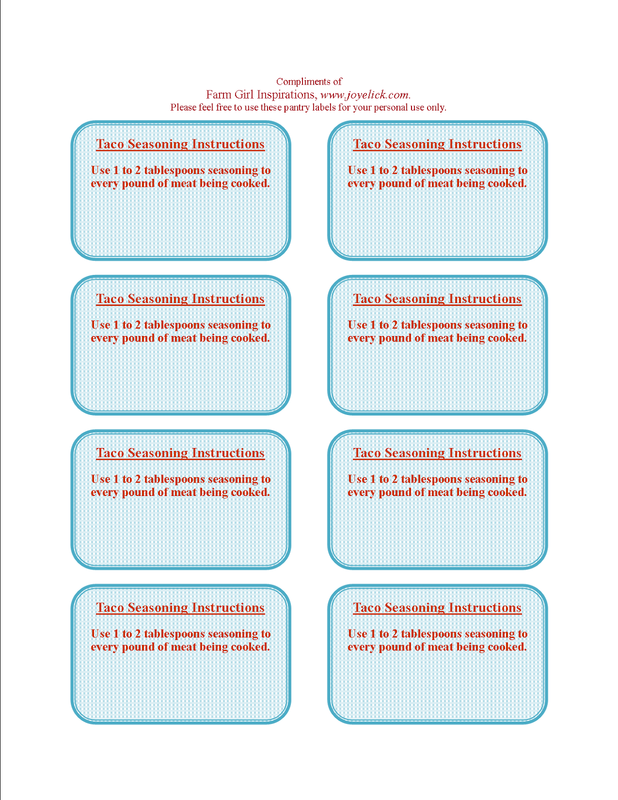 Today's recipe for taco seasoning can get you started! * Red pepper flakes will make the mix spicy--adjust more or less to taste. Combine all ingredients in a medium bowl and whisk together until thoroughly blended. Store your taco seasoning in a pint-size jar, or another air-tight container in your pantry. Use 1 to 2 tablespoons taco seasoning mix per pound of meat cooked. Cook and drain meat, then sprinkle on the seasoning. Allow to cook for another minute or two, then turn off the heat. 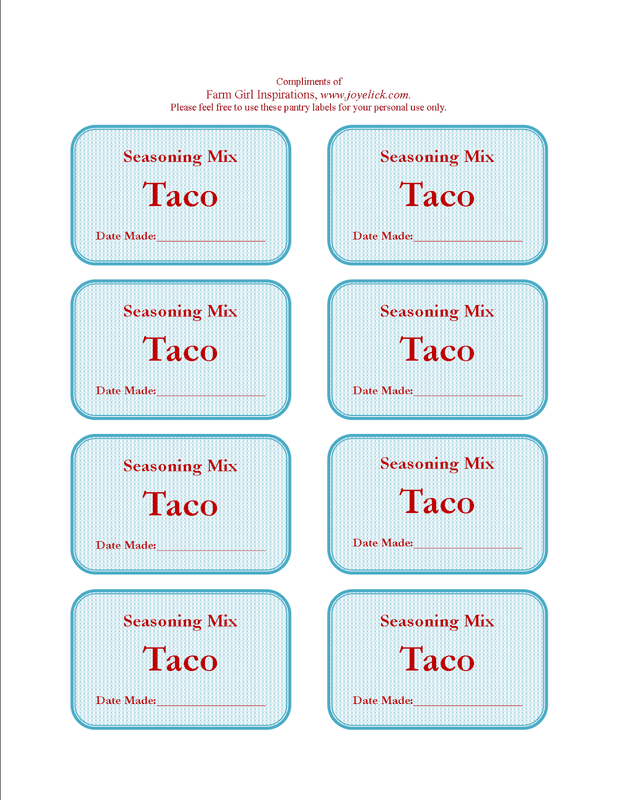 CLICK HERE to download your free Taco Seasoning Mix Labels. 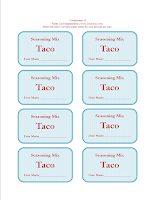 CLICK HERE to download your free Taco Seasoning Mix Instruction Labels. What homemade dry mixes are a must in your pantry? I'd love to hear your story. Yay! I'm glad you're going to try this, Emily! Should the second ingredient be chili "powder"? Oh my goodness, yes! I've corrected that now. Thank you.